Myers' value to the Jets? Well, it's complicated - The Point Data-driven hockey storytelling that gets right to the point. 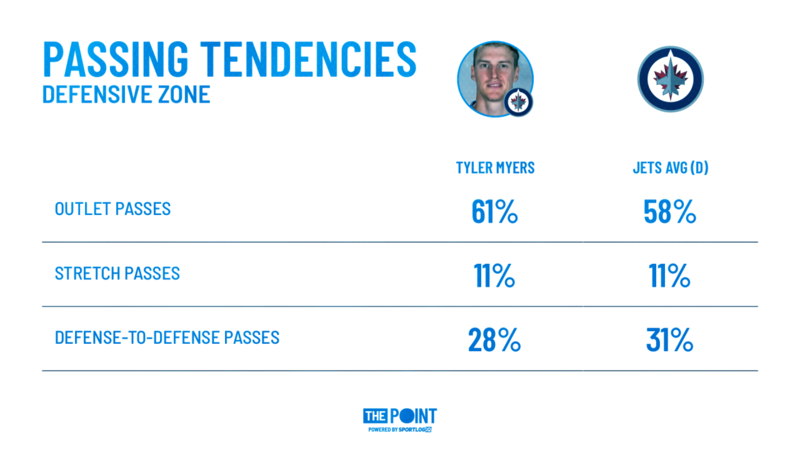 Ever since he won the Calder Trophy as a rookie with the Buffalo Sabres in 2009-10, Tyler Myers has been a bit of a divisive figure in the hockey analytics community. He has never reached the offensive heights of his rookie season, and there have been times that he has struggled in a big way defensively. At times he has been viewed as a solid top pairing defenseman, or at least a player with the potential to be one, while at others many have seen him as a third pairing guy at best. Injuries have certainly muddied the situation as well. 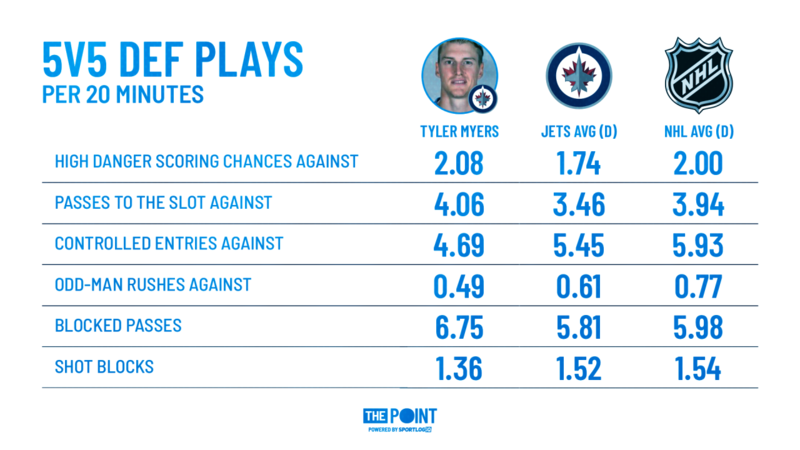 Last season Myers played a bit more than Morrissey did, something that seems to be about to change as Morrissey is now slotted into the Jets’ top-four with Jacob Trouba, so in all likelihood, Myers will be facing some decreased levels of competition this season. That’s important because last season Myers had some very wild fluctuations in his defensive strengths and weaknesses. Myers’ big frame was often lauded as a reason he would be a top shut down defender when he was young, but he has always been a bit gangly and can struggle to defend in tight to players, which is probably why his in-zone defense is not so great. Myers was the worst on the Jets’ defense last year in allowing high danger scoring chances and passes to the slot against while on the ice, meaning that teams were able to find holes in his coverage on a fairly consistent basis. In the neutral zone though, the opposite was true. Myers’ reach and good stick work lead to the Jets facing the fewest controlled entries and odd-man rushes against while he was on the ice of any of their defencemen, so while he can be broken down by cycling and forechecking plays, he is a strong defender off the rush. Myers is also a very good pass blocker, leading to possession changes and quick counter-attacks, which is how he creates a good portion of his offense, joining the rush as the late man. Shot blocking, however, is a weakness for him. It isn’t that he doesn’t attempt many, but that his blocks are rarely successful, only 74.8% of his attempted shot blocks are successful when the league average is well over 80%. Those long legs leave sizeable holes for opponents to shoot through, meaning he can often get caught screening his own goaltender and even deflecting pucks accidentally to make shots even tougher to stop. This is the consistent situation with Myers; tantalizing skill and absolute dominance in some areas, but weaknesses in other areas that are just as important keep him from reaching the potential that so many saw in his rookie season. One area you have to give Myers credit though is his defensive zone passing, an area where he has a high success rate despite making more difficult passes than his teammates. The Jets are about an average team in how often they like to reverse the puck back D2D, or essentially a lateral pass in the defensive zone that doesn’t push the puck forward. Myers, meanwhile, doesn’t like to mess around in his own zone and goes for outlet passes, forward passes with the intended receiver not past center ice, more often than anyone else on the Jets’ defense. He doesn’t go for stretch passes, passes where the intended receiver is beyond center ice, as often as his average teammate, but that works well since those passes have lower success rates. So what is Tyler Myers? 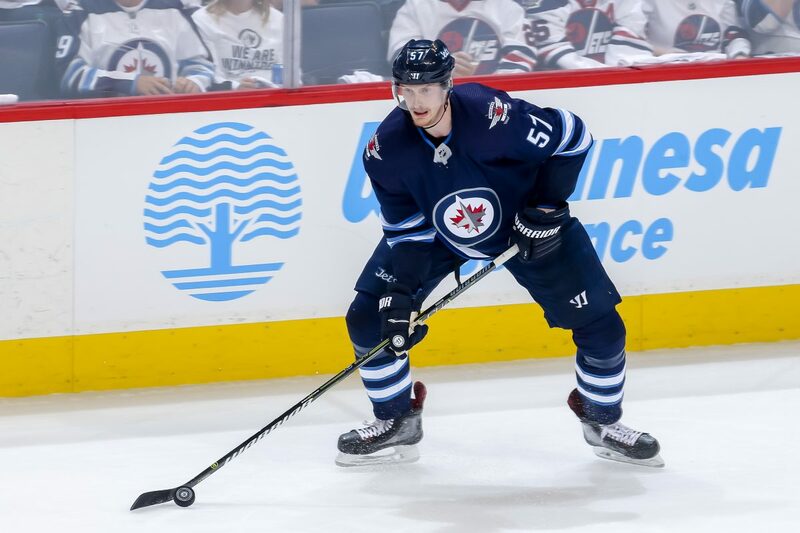 The Jets don’t need him to be a world-beating talent, he’ll be playing most of the season behind Dustin Byfuglien and Josh Morrissey on the right side, but he has the potential to be a player that tips the scales for them against teams that don’t have the Jets’ depth. In order to take full advantage of Myers’ skills, ideally the Jets would play him with wingers who don’t cheat too far out of the defensive zone on breakouts, so he can make short outlet passes to transition the puck quickly after he wins possession of the puck, and partner him with a player who can cover for some of his flaws defending in the Jets’ own zone. Myers is by no means a perfect player, but he could be a key for the Jets if utilized in an optimized way.